Grow a new lawn or repair an existing lawn with this sod-like grass seed by Jonathan Green. Contains Kentucky bluegrass seed for a rich, thick lawn. Grows a new lawn quickly and easily. Available in two sizes. Sod Maker Grass Seed has different options and/or variations, please choose below. This product cannot ship to AK, AL, AR, CO, DC, FL, GA, HI, ID, IL, LA, MS, MT, NM, OR, RI, TN, TX, UT, WY due to state restrictions. 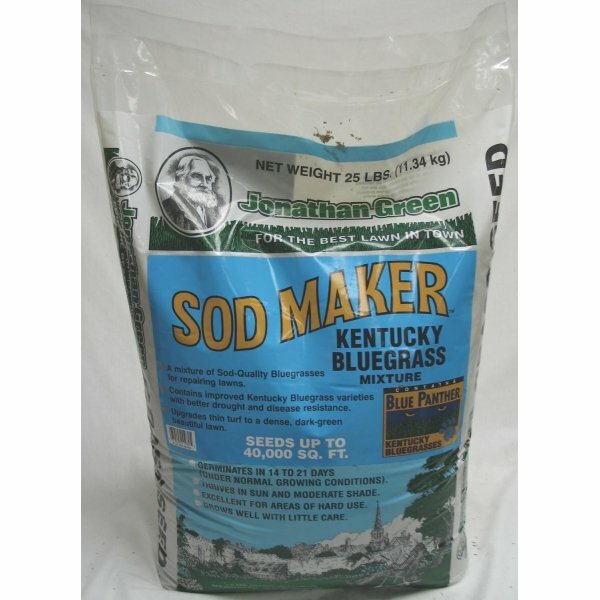 The Sod Maker Grass Seed by Jonathan Green is great for transforming your lawn into sod-like grass. Contains high quality seed that grows into a Kentucky Bluegrass lawn. Beautiful and easy to use on your lawn. Use to create a new lawn or on an existing lawn. 3-lb. - 4,800 sq. ft.
25-lb. - 40,000 sq. ft.